Paul holds degrees in sociology, social policy, computer science and education. His main research interest is the nexus between social policy, administration and digital information technologies. His research interests include: social policy; welfare state; welfare reform; e-government; the administration of policy; costs of raising children. Governments have been using digital technologies for decades, with implications for the operation and power of the state, and its relationship with and governance of citizens. Increasingly algorithmic government and AI is heightening concerns with government accountability and transparency, and reproduction of bias, discrimination and inequalities. Charting these dynamics and developing policy and governance frameworks is an urgent research agenda. Henman, Paul and Graham, Tim (2018). The web ecology of the online state: the case of Australia. 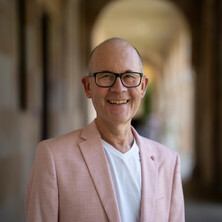 , School of Social Science, The University of Queensland. Performing the state: critical encounters with performance measurement in social and public policy. Edited by Paul Henman and Alison Gable Abingdon, United Kingdom: Routledge, 2018. Administering Welfare Reform: International Transformations in Welfare Governance. Edited by Paul Henman and Menno Fenger Bristol, U.K.: Policy Press, 2006. Fenger, M. and Henman, P. W. (2006). Introduction: Administering welfare reform. In P. Henman and M. Fenger (Ed. ), Administering Welfare Reform: International Transformations in Welfare Governance (pp. 1-17) Bristol, United Kingdom: Policy Press. Fenger, Menno and Henman, Paul (2006). Introduction: Administering welfare reform. In Administering Welfare Reform: International Transformations in Welfare Governance (pp. 1-18) : Policy Press. Henman, Paul and Fenger, Menno (2006). Reforming welfare governance: Reflections. In Paul Henman and Menno Fenger (Ed. ), Administering Welfare Reform: International Transformations in Welfare Governance (pp. 257-278) Bristol, United Kingdom: Policy Press. Henman, Paul (2006). Segmentation and conditionality: Technological reconfigurations in social policy. In G. Marston and C. McDonald (Ed. ), Analysing Social Policy: A Governmental Approach (pp. 205-222) Cheltenham, UK: Edward Elgar. Henman, Paul (2006). Welfare reform as governance reform: The prospects of a governmentality perspective. In P. Henman and M. Fenger (Ed. ), Administering Welfare Reform: International Transformations in Welfare Governance (pp. 19-41) Bristol: Policy Press. Henman, Paul (2006). Welfare reform as governance reform: The prospects of a governmentality perspective. In Administering Welfare Reform: International Transformations in Welfare Governance (pp. 19-42) : Policy Press. Henman, Paul, Brown, Scott D. and Dennis, Simon (2017) When rating systems do not rate: evaluating ERA’s performance (AUR 59 01). Australian Universities' Review, 59 1: 58-68. Henman, Paul, Ackland, Rob and Graham, Tim (2014) Networks of communities and communities of networks in online government. Electronic Journal of e-Government, 12 2: 117-131. Karimshah, Ameera, Wyder, Marianne, Henman, Paul, Tay, Dwight, Capelin, Elizabeth and Short, Patricia (2013) Overcoming adversity among low SES students: a study of strategies for retention. Australian Universities' Review, 55 2: 5-14. Henman, Paul and Jones, Andrew (2012) Exploring the use of residual measures of housing affordability in Australia: Methodologies and concepts. AHURI Final Report, 180: i-35. Henman, Paul (2012) The power of e-government: technical, discursive, human. Politik, 15 3: 5-13. Henman, Paul (2004) E-government and the electronic transformation of modes of rule: The Case of partnerships. Journal of Systemics, Cybernetics and Informatics, 2 2: 19-24. E-government: Transformations in modes of rule? Henman, Paul and Perry, Julia (2002) Welfare dependency? A critical analysis of changes in welfare recipient numbers. Australian Journal of Social Issues, 37 3: 315-334. Henman, Paul (2002) Deconstructing welfare dependency: The case of Australian welfare reform. Radical Statistics, 79/80 7-17. Henman, P and Perry, J (2002) Welfare dependency? A critical analysis of changes in welfare recipient numbers. Australian Journal of Social Issues, 37 3: 315-335. Henman, P and Mitchell, K (2001) Estimating the cost of contact for non-resident parents: A budget standards approach. Journal of Social Policy, 30 495-520. Henman, P. W. (1999) The bane and benefits of computers in Australia's Department of Social Security. International Journal of Sociology and Social Policy, 19 1/2: 101-109. Wallang, Muslimin, Henman, Paul and Gillingham, Philip (2015). Different patterns of usage of e-government services: a preliminary study. In: Carl Adams, Proceedings of the 15th European Conference on eGovernment, ECEG 2015. 15th European Conference on eGovernment, University of Portsmouth, Portsmouth, United Kingdom, (436-442). 18-19 June 2015. Henman, Paul, Ackland, Rob and Graham, Tim (2014). Community structure in e-Government hyperlink networks. In: Alexandru Ionas, Proceedings of the 14th European Conference on eGovernment. ECEG 2014: 14th European Conference on eGovernment, Braşov, Romania, (135-143). 12-13 June, 2014. Henman, Paul, Ackland, Rob and Graham, Tim (2014). Social policy on the Web: the online institutional structure of social policy domains in the UK. In: Alexandru Ionas, Proceedings of the 14th European Conference on eGovernment. ECEG 2014: 14th European Conference on eGovernment, Braşov, Romania, (126-134). 12-13 June, 2014. Henman, Paul, Ackland, Rob, Graham, Tim and Chen, Lin (2013). Social policy on the Web: the institutional structure of social policy domains in Australia and the UK. In: Social Policy Association Annual Conference 2013, Sheffield, UK, (). 8-10 July, 2013. Breit, Rhonda, Henman, Paul and Snell, Rick (2012). Towards a qualitative approach to evaluating access to information legislation. In: CPRafrica 2012/CPRsouth7: Papers, presentations and policy briefs. CPRafrica 2012/CPRsouth7 Conference, Port Louis, Mauritius, (). 5 - 7 September 2012. Waite, Greg, Henman, Paul, Banks, Chris and Curtis, Chris (2010). The dynamics of financial hardship and housing need: A longitudinal analysis using budget standards. In: B. Randolph, T. Burke, K. Hulse and V. Milligan, Refereed papers presented at the 4th Australasian Housing Researchers Conference. 4th Australasian Housing Researchers Conference (AHRC 2009), Sydney, Australia, (1-12). 5 - 7 August 2009. Henman, Paul (2009). The contribution of e-government to the "new conditionality" in social policy. In: Dan Remenyi, Proceedings of the 9th European Conference on e-Government. 9th European Conference on e-Government, London, England, (345-351). 29-30 June, 2009. Henman, Paul (2008). The constitution and governance of time through e-government. In: Remenyi, D, The 4th international conference on e-government, proceedings. The 4th international conference on e-government, RMIT University, Melbourne, Australia, (187-194). 23-24 October 2008. Waite, and Henman, P W (2006). Applying budget standards to assess housing affordability. In: S. Darby, P. Flatau and I. Hafekost, Building for Diversity: National Housing Conference 2005. National Housing Conference 2005, Perth, (195-214). 26-28 October, 2005. Henman, P. W. (2005). e-Government, public policy and the growth of conditionality. In: D. Remenyi, 5th European Conference on e-Government. 5th European Conference on e-Government, Antwerp, Belgium, (223-229). 16-17 June, 2005. Henman, Paul (2004). E-government and the electronic transformation of modes of rule: The case of partnerships. In: J. V. Carrasquero, F. Welsc, C. Urrea and C. D. Tso, Journal of Systemics, Cybernetics and Informatics. Selected proceedings of 2nd International Conference on Politics and Information Systems. 2nd International Conference on Politics and Information Systems, Orlando, Florida, (19-24). July 21 - 25, 2004. Gaby, Sharon and Henman, Paul (2004). E-health: Transforming doctor-patient relationships with a dose of technology. In: W. Roberts and P. Chen, Refereed Conference proceedings of the Australian Electronic Governance Conference 2004. The Australian Electronic Governance Conference 2004, Centre for Public Policy, University of Melbourne, Victoria, (1-25). 14-15 April 2004. Henman, Paul and Dean, Mitchell (2004). The governmental powers of welfare e-administration. In: W. Roberts and P. Chen, Refereed Conference proceedings of Australian Electronic Governance Conference 2004. Australian Electronic Governance Conference 2004, Centre for Public Policy, University of Melbourne, Victoria, (). 14-15 April 2004. Henman, Paul (2002). The poverty of welfare reform discourse. In: T. Eardley and B. Bradbury, Refereed Proceedings of the National Social Policy Conference 2001. National Social Policy Conference 2001, University of New South Wales, Sydney, Australia, (180-191). 4-6 July 2001. Road-to-where? The politics and practice of welfare-to-work: Refereed Proceedings of the 2006 National Conference, 17-18 July, Brisbane (2006) . Edited by Greg Marston, Paul Henman and Catherine McDonald. Welfare-to-Work Forum: Road to where? The politics and practice of implementing welfare-to-work, 17-18 July 2006, The Carlton Crest Hotel, Brisbane, Qld.. Working It Out: Attitudes and Aspirations of Young Adults in the Contemporary Labour Market.